Campbell Hausfeld air compressors are used to run power tools such as spray guns, drills, sandblasters and die grinders. More than 70 tools are offered by Campbell Hausfeld that can be used with an air compressor. These tools are less expensive than their electrical counterparts, which makes the purchase of an air compressor an economical choice for anyone needing to use these types of tools on a regular basis. If your Campbell Hausfeld air compressor does not work as it should, troubleshoot it and save money on repairs. Allow the motor to cool if the thermal overload has been tripped and turned the compressor off. Disconnect extension cords and plug the air compressor power cord directly into an electrical outlet. If the air compressor runs, the extension cords are too long or the wrong gauge. Use a different extension cord. Contact a service center and have the pressure switch replaced. 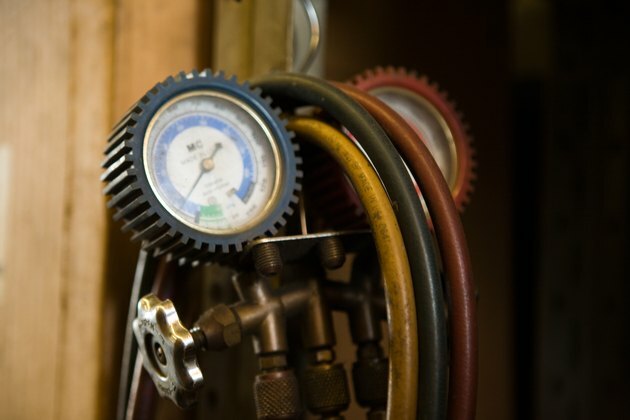 Use an extension cord of an appropriate gauge for the particular model of air compressor. The gauge needed will vary from model to model. Place the air compressor in a well-ventilated area. The thermal overload protector will turn the compressor off if it is placed in a poorly ventilated area or used in areas with high temperatures. Have the compressor inspected by a service technician if it continues to trip repeatedly. Mix liquid soap with water and apply the solution to all fitting and connections. If bubbles appear, there is an air leak. Tighten the fittings or connections. Replace if needed. Inspect the gaskets and replace faulty or blown gaskets. Remove the head on the top of the air compressor and inspect the inlet valves. Replace broken inlet valves. Replace the old head gasket with a new gasket, and replace the head. Tighten the pulley clamps bolts and set-screws with a screwdriver. The pulley clamps are located on the top of the compressor. Remove the piston assemblies and inspect for wear. Replace the piston pin or pistons if needed. Remove the compressor head and valve plate on the top of the compressor. Install a new valve plate and head gasket.